The morning after... where were the bodies? Home Titanic Research Articles The morning after... where were the bodies? Left: Old fittings photograph of theTitanic. Right: Rare card postmarked May 7, 1912, which identifies the photograph as the steamship Titanic but that is, in fact, the Lusitania. The life belt held the victims shoulders out of the water. Sometimes a larger wave made her entire body disappear. Her head was drawn back, and she faced upward, in the form of a figurine broken off an old ships bow. The womans hair and arms frolicked around, affording the men a glimpse at the waters angelic playfulness. An overturned lifeboat in the sea between the cutter and the steamer seemed painted into this scene. Little more than a raft, with canvas sides, the broken boat resisted efforts to recover it. But, not the mens axes. Mrs. Pålsson was one of several hundred bodies recovered by various ships, in April and May 1912, after the Titanic disaster. Roughly 1,526 people died when the ship foundered at 2:20 a.m., on April 15, 1912. Most people went down with the ship. But several hundred were either buried at sea or brought back, claimed by relatives, or buried in Halifax. The bodies found floating in the sea were mostly third class passengers, emigrants and crewman.4 They included children, mothers and fathers. As the rank and file, they were, by far, the most vulnerable of Titanics victims. The cruelty of the disaster is most evident with the bodies. Indeed, some of them appeared battered, bruised, and cut up from the event of the sinking. They were frozen in the treacherously cold north Atlantic, at night, and were bleached by the sunlight, during the day. As if an amusement for a cruel sea, they bobbed, had their faces repeatedly dunked in the water, and became wrinkled and discolored as they decomposed. These were people with hopes, ideals, struggles --- each had an important story to tell. Brothers, sisters, parents, and children had loved them. Most of them had families and careers. Later, in Halifax, photographs were taken of them. As we shall see, the images of the bodies may be the starkest, most unalterable and truthful testimony to the ravages wrought by the Titanics foundering. Mr. EVANS. One died on the way back, sir. There were plenty of dead bodies about us. Senator SMITH. How many? Scores of them? Mr. EVANS. You couldn't hardly count them, sir. I was afraid to look over the sides because it might break my nerves down. Senator SMITH. A good many dead? Senator SMITH. Did you see any women dead in the water? Mr. EVANS. No, sir; mostly men. Senator SMITH. Was it daylight at this time? Mr. EVANS. Just breaking daylight. Able seaman Edward J. Buley also noted that his boat was among the bodies and the wreckage when Carpathia appeared. Senator FLETCHER. Did you get very far away from where the Titanic went down before the Carpathia was in sight? Mr. BULEY. No, sir. When the Carpathia came and hove to, we were still amongst the wreckage looking for bodies. Mr. Scarrot: The boats were made fast and the passengers were transferred, and we went away and went among the wreckage. When we got to where the cries were we were amongst hundreds, I should say, of dead bodies floating in lifebelts. 440. Was it dark then? - Yes. 441. Still dark? - Yes, and the wreckage and bodies seemed to be all hanging in one cluster. When we got up to it we got one man, and we got him in the stern of the boat . . . the wreckage were that thick - and I am sorry to say there were more bodies than there was wreckage . . . We made sail and sailed back to take our other boats in tow that could not manage themselves at all. We made sail then, but just as we were getting clear of the wreckage we sighted the "Carpathia's" lights. 2991. How far away from the "Titanic" were you? - About 150 yards. 2992. After she sank did your boat pull in towards the place where she sank? - Yes. 2993. For what purpose? - To pick up anybody who was there. 2994. Was there anybody there? - I never saw anybody. 2995. Did you see any corpses? - No. 2996. You saw nothing? - I saw some by daylight. Thus, when Carpathia appeared, at daylight (approximately 4:10 a.m.), the bodies were seen by persons in life boats, near the wreckage left by the Titanic. MR. COLLINS. She stopped in the one place, and, I think, lowered two or three of her own boats, and her own boats were kept in the water when one of our boats, the sailboat, went up alongside of her. Senator BOURNE. Why did the Carpathia lower any of her boats as long as none of your boats were in distress? Mr. COLLINS. To take up some of the bodies that had been washed up by the side of her. NEW YORK, April 19. 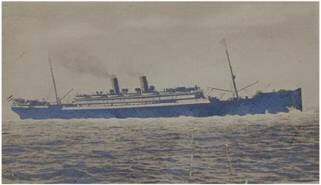 Simon Senegel, a Montreal merchant, who was a passenger on the Carpathia, said that after his vessel had rescued boatloads of women, a life raft on which were about twenty-four person was seen. Poingdestre, Evans, Scarrot and Wilburn, strongly corroborate that the bodies were out there and visible to persons on the morning of April 15, 1912. Further, the Collins and Senegel accounts would appear to specifically establish that the bodies were seen, at least by some persons, from Carpathia. Partial corroboration of Senegals account of the raft is found in the testimony of Frederick Ray, the Titanics saloon steward, who  like Senegel  says that saw the overturned life boat, from Carpathia. Senator FLETCHER. Did you see the collapsible boats? Mr. RAY. No sir; not that I know of; I did not see any collapsible boats. Senator FLETCHER. In the morning? Mr. RAY. No, sir; only one that was turned upside down in the morning. Senator FLETCHER. Where was that; how far away from the wreck? Mr. RAY. They were floating away. I saw that later on in the morning after I got on the Carpathia. Senator FLETCHER. There was nobody in that boat then? Mr. RAY. No, sir; they had been taken off. Senator FLETCHER. Did the Carpathia come to you or did you go to the Carpathia? Mr. WARD. We partially rowed and she partially came some of the way. We saw her at a distance. She was headed our way. She stopped and slued around a little, and we surmised that she was then picking up a boat. It was hardly light enough to see at the time. It was just breaking day at that time, but we could see her lights. Then, of course, we started to pull toward her. I think we were about the fourth or fifth boat to be picked up. Senator FLETCHER. You were picked up about how far from where the Titanic went down? Mr. WARD. I should not think it would be more than about half a mile or so. Carpathia, however, left without picking up any more bodies. Many other witnesses saw fields of bodies floating in the abyss, for example, when the Nordeutscher Lloyd passenger liner Bremen bypassed the disaster site on Saturday, April 20, 1912. The Nordeutscher Lloyd steamship S.S. Bremen. On the morning of April 15, 1912, Carpathias Captain Arthur Henry Rostron, like Mackay-Bennett and Bremen, saw the overturned life boat. He observed the entire four mile wide area, at daybreak. It was horrific, with wreckage, and lots of ice. He accounted for all the lifeboats.14 After recovering the survivors in the life boats, Rostron left the scene. of the Titanic disaster. She was torpedoed during World War I. By the time we had the first boat's people it was breaking day, and then I could see the remaining boats all around within an area of about 4 miles. I also saw icebergs all around me. There were about 20 icebergs that would be anywhere from about 150 to 200 feet high and numerous smaller bergs; also numerous what we call "growlers." You would not call them bergs. They were anywhere from 10 to 12 feet high and 10 to 15 feet long above the water. I maneuvered the ship and we gradually got all the boats together. 25496. Did you see any wreckage at all of the "Titanic"?  (Rostron) The only wreckage we saw there was very small stuff - a few deck chairs and pieces of cork from lifebelts, and a few lifebelts knocking about, and things of that description, all very small stuff indeed. There was very little indeed. 25497. Any bodies in the water? - We only saw one body. 25498. Would this be between four and six o'clock or something like that? - When we got up to the wreckage it would be about twenty minutes to eight, or a quarter to eight, or something like that. 25499. But you had been close to the spot for some time, had you not? - Yes, but we had not seen this wreckage. We had been dodging about picking up the other boats. I had not any idea where the wreckage was. As soon as we had finished taking the passengers from the boats I cleared off to another boat to pick them up, and was dodging about all over the place to pick them up. It was only when we got to the last boat that we got close up to the wreckage. It was close up to the wreckage. It would be about a quarter to eight when we got there. 25500. (The Commissioner.) I understand you to say those boats were spread over an area of five miles? - Four to five miles, yes. Senator SMITH. Did you see any floating bodies? Mr. BOXHALL. I saw one floating body, sir. Senator SMITH. That of a man or woman? Mr. BOXHALL. A man, sir. Senator SMITH. I understood you to say that. What I particularly desired to know was whether at that time you saw any of the wreckage or floating bodies, dead or alive? Mr. LIGHTOLLER. I saw none. 7029. Did you see any wreckage anywhere? - I did. 7030. Where? - Near the "Carpathia." 7031. What did you see? - I saw several boats, deck chairs, cushions, planks. 7033. Did you see any bodies? - No. 7034. Any lifebelts floating? - No. 7035. Any wreckage? - Yes. 7036. Much? - Not a great deal. 7037. Did you cruise round and search? - I did. Rostron got close to the wreckage before he had finished getting everyone aboard, in other words, before 8:30 a.m. Notably, Rostron then sent everyone inside for a memorial service. of course, and I maneuvered around the scene of the wreckage. I did not take him aboard. For one reason, the Titanics passengers then were knocking about the deck and I did not want to cause any unnecessary excitement or any more hysteria among them, so I steamed past, trying to get them not to see it. The above testimony is somewhat inconsistent with Rostrons British inquiry testimony, where he says he dodged about all over the place to pick up the life boats, not to avoid passengers seeing bodies. In any event, his American inquiry testimony suggests that he maneuvered or dodged to avoid passengers seeing a dead body or, perhaps, bodies. Of course lots of gear had been knocked out of the boats and thrown out of the way of the people as they were getting up; so, while they were holding this service and while I was cruising around, I had had all of my boats swung out, ready for lowering . . .
Rostron admitted that he knew that Titanics passengers were wearing lifebelts --- but, he testified, he learned about the life belts later, on Tuesday afternoon, from passengers. Mr. ROSTRON. I had very little opportunity of being amongst the passengers or any of them. To tell you the truth, I have been on the bridge, or about my duties most of the time. I had, however, one or two conversations with the passengers on Tuesday afternoon. That was the only time I had anything to do with the people, as I heard then that all the people on the Titanic, as far as they could see, had lifebelts on. They had all been supplied with lifebelts. Senator SMITH. I assume that you kept watch to see whether there was any of these people afloat? Mr. ROSTRON. Precisely. I was cruising all around the vicinity of the disaster. Senator SMITH. How long did you cruise around there? Mr. ROSTRON. In the actual vicinity of the disaster? Senator SMITH. Yes. Mr. ROSTRON. Half an hour. Passengers in the life boats approaching Carpathia were wearing life belts. Rostron saw those boats. Why did Rostron say that he learned only later on, the afternoon of the next day, Tuesday, that passengers aboard the Titanic had worn life belts? It seems incredible that literally fields of bodies could be seen days later by Bremens passengers, and scores of bodies, by Scarrot, only hours before Carpathia came up --- yet Rostron and Boxhall reported seeing only one, and Lightoller and Lord, none whatsoever. Senator Smith, too, noted the incongruity, and said so in his questioning of Boxhall. Senator SMITH. Is that the only body you saw? Mr. BOXHALL. That is the only body I saw. Senator SMITH. The only body you saw either dead or alive? Mr. BOXHALL. Yes; dead or alive. Senator SMITH. There must have been hundreds of bodies in the water about the Titanic. Mr. BOXHALL. No one ever saw any, at all. Who is to be believed? The answer calls for reading between the lines and connecting the dots . . . the white dots, in particular. Senator SMITH. You say the captain of a ship is vested ordinarily with absolute control and discretion over the movements of his vessel? Mr. ROSTRON. Absolutely. I wish to qualify that, however. By law, the captain of the vessel has absolute control, but suppose we get orders from the owners of the vessel to do a certain thing and we do not carry it out. The only thing is then that we are liable to dismissal. A company man has no secrets from his bosses. As set forth above, with his accounts above having swung out the boats, and learning about life belts in the afternoon, Rostron does not appear to have been a credible witness to the Senate Committee. Concededly, the Senators flattered him for rescuing the survivors. But Rostron evaded questions, gave some silly answers, and adopted a company mans posture. As of Friday, April 19, 1912, when Rostron testified, it had not yet been reported that passengers aboard the Bremen had seen fields of bodies. Further, Rostron testified on the first day of the proceedings and, as such, didnt know what the passengers would say. Perhaps they would contradict him . . . perhaps they saw all the bodies out there . . . maybe they saw him lower Carpathias life boats to pick up bodies washed alongside . . . as John Collins testified. Rostron did what most company men do when they are called as witnesses. He didnt offer much testimony, supported the status quo, and constantly tried to leave himself openings so that he could rehabilitate his testimony, if necessary. 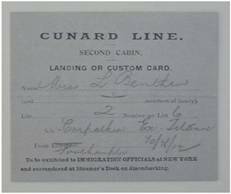 Reproduction of Cunards landing card aboard the Carpathia. Frankly, the aftermath of the Titanic disaster was not a time for company men to beguile the public. But Rostron did. He defended Captain Smith, even likened himself to Smith in running his ship at top speed. Additionally, Rostron tried to rationalize the British Board of Trades inadequate life boat regulations as legitimate because newly-designed ocean liners were life boats in themselves. Senator SMITH. Are these regulations of the British Board of Trade new regulations or old regulations? Mr. ROSTRON. They are of recent date. Mr. ROSTRON. (interposing): No, sir; it has nothing to do with that. What it has to do with is the ship itself. The ships are built nowadays to be practically unsinkable, and each ship is supposed to be a lifeboat in itself. The boats are merely supposed to be put on as a standby. The ships are supposed to be built, and the naval architects say they are, unsinkable under certain conditions. Senator NEWLANDS. How do you account for the fact that the Board of Trade of England, as the size of these ships has increased, has not compelled an increase in the number of life boats? Your maximum, as I understand, is 20 boats, is it not? Mr. ROSTRON. Yes, I believe it is. But they have compelled a different construction of the ship itself. That is where the thing has come in. Senator NEWLANDS. You regard each ship itself as a lifeboat? Senator NEWLANDS. That expectation was not realized in the case of this ship? Mr. ROSTRON. It has been an abnormal experience as regards the Titanic. Even though he would later rebuff Stanley Lord, when Lord asked for his help, Rostron came to Captain Smiths defense. Rostron initially dodged the question of whether, like Smith, he would have run his ship at top speed, in an ice field. Then, incredibly, he drew an analogy between himself and Smith. Senator SMITH. What would be a safe, reasonable speed for a vessel of that size on such a course and in proximity of icebergs? Mr. ROSTRON. Of course I do not know the ship. I know absolutely nothing about her. Senator SMITH. How would you have felt yourself about it. Suppose you had been taking that course with your ship; how fast would you have felt it prudent to go in such a situation? Mr. ROSTRON. I can only tell you this, gentlemen, I knew there was ice about. Senator SMITH. You went full speed? Mr. ROSTRON. I did, and doubled my lookouts, and took extra precautions and exerted extra vigilance. Every possible care was taken . . . Senator SMITH. You had a smaller ship, however, and it would respond more readily to a signal? Senator SMITH. Would it not? Mr. ROSTRON. No, sir; it would not. I do not maintain that, for one moment. So, in effect, just like Titanic, Captain Rostron took the risk, went at a high speed into an ice field, and came out of it still afloat. Thus, he contended, going full speed wasnt necessarily improper. Ismay in immediately sailing back to New York, and otherwise accommodating Ismays desires, including, no less, collaborating on marconigrams, and maintaining a level of silence vis-à-vis the shore, for a long while. Senator SMITH. Captain, is it customary to take orders from a director or a general officer of the company aboard? Senator SMITH. From whom do you take orders? Mr. ROSTRON. From no one. Mr. ROSTRON. At sea, immediately I leave port until I arrive at port, the captain is in absolute control and takes orders from no one. I have never known it in our company or any other big company when a director or a managing owner would issue orders on that ship. It matters not who comes on board that ship they are either passengers or crew. There is no official status and no authority whatever with them. While, perhaps, technically true, Rostrons other statements, and his constant checking with C. Bruce Ismay relative to any of his actions, seemed to beguile his representation that persons such as Ismay had no authority aboard Carpathia. Further, everyone knew that members of the shipping industrys management, such as Ismay, were exceedingly powerful. They held wide influence in the industry, even with Cunards executives, such as its Managing Director, Booth, who was Rostrons boss. Senator SMITH. And you immediately reversed your course? Mr. ROSTRON. I came right around for New York immediately, and returned to New York. Would you like to know my reasons for coming back to New York? Mr. ROSTRON. The first and principal reason was that we had all these women aboard, and I knew they were hysterical and in a bad state. I knew very well, also, that you would want all the news possible. I knew very well, further, that if I went to Halifax, we could get them there all right, but I did not know how many of these people were half dead, how many were injured, or how many were really sick, or anything like that. I knew, also, that if we went to Halifax, we would have the possibility of coming across more ice, and I knew very well what the effect of that would be on people who had had the experience these people had had. I knew what that would be the whole time we were in the vicinity of ice. I took that into consideration. I knew very well that if we went to Halifax it would be a case of railway journey for these passengers, as I knew they would have to go to New York, and there would be all the miseries of that. Furthermore, I did not know what the condition of the weather might be, or what accommodation I could give them in Halifax, and that was a great consideration - one of the greatest considerations that made me turn back. These dont sound like very good reasons, or truthful ones. In fact, Rostron may not have immediately turned his ship around and headed for New York. Wireless officer Harold Cottam testified that they originally aimed for Halifax. Mr. COTTAM. ... Yes; I believe I did mention something about Halifax, sir, simply because the captain was bound for Halifax first, and then he changed his mind and was bound for New York. I may have mentioned Halifax. I can not quite remember whether I mentioned Halifax at first. Senator SMITH. You say the captain was bound for Halifax? Senator SMITH. How do you know? Mr. COTTAM. I went and asked the captain, sir. Three or four ships around about wanted to know where we were bound for, and the captain said he was not decided, he thought he was bound for Halifax; but later on in the morning he changed his mind. Senator SMITH. At what time? Mr. COTTAM. I can not remember the time. Senator SMITH. About what time? Was it forenoon? Mr. COTTAM. It may have been about noon. Senator SMITH. Was it necessary to change his course, in changing his mind? Senator NEWLANDS. Well, the ship [Carpathia] soon took a direction toward the southwest, did it not? Mr. MOORE. I could not say. Senator NEWLANDS. It must have done so in order to go to New York. Mr. MOORE. I should say it went to the westward, sir. Titanics owners had actually chartered a train there to pick up the survivors and return them to New York. Thus, P. Franklin and the owners in New York do not appear to have influenced the decision, since they were willing to move the passengers out of Halifax. Obviously, the senators strongly suspected that Rostron came back to New York, and not Halifax (even though Halifax was closer), at the instigation of Ismay. Rostron argued that he was perfectly right in making this decision to go to New York, purportedly without yet having Cunard's approval --- pretty gutsy for a company man. Senator SMITH. And you took the chance? Mr. ROSTRON. It was hardly a chance. Of course it was a chance, but at the same time I knew quite what I was doing. I considered that I was perfectly free, and that I was doing perfectly right in what I did. Senator SMITH. I suppose no criticism has been passed upon you for it? Mr. ROSTRON. No. Rostron became so self-assured during the course of the interrogation that he refused to answer some of the Senators questions, suggesting that he didnt want to speculate. He even levied a shot at ordinary passengers. Senator SMITH. Have you any kind of knowledge at all regarding the force of the impact which wrecked the Titanic? Mr. ROSTRON. I know nothing about it, sir. I have not asked any questions about this kind of business. I knew it was not my affair, and I had little desire to make any of the officers feel it any more than they did. Mind you sir, there is only this: I know nothing, but I have heard rumors of different passengers; some will say one thing and some another. I would, therefore, rather say nothing. I do not know anything. From the officers I know nothing. I could give you silly rumors of passengers, but I know they are not reliable, from my own experience; so, if you will excuse me, I would prefer to say nothing. Rostron presented himself as a patronizing, self-assured company man who defended the organization, and the industry. Based on the foregoing, he did not turn out to be a particularly credible witness. 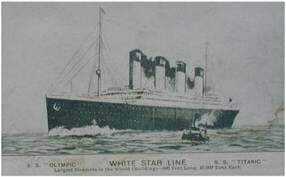 Postcard of Olympic Class ship. But between the lines, and among the dots, even the articulate company man of the Carpathia revealed some key facts which would connect him to the bodies. For example, Rostron admitted that he saw the overturned life boat near the wreckage . . . as did the Bremens passengers, Mackay-Bennett, and several of Titanics crew, who saw the overturned life boat near the bodies. Senator SMITH. How many of those were there? Mr. ROSTRON. We accounted for two. One of these berthon boats capsized. That was three. 25476. You picked up that boat. Altogether how many boats did you pick up? - We got 13 lifeboats alongside, two emergency boats, two Berthon boats. There was one lifeboat which we saw was abandoned, and one of the Berthon boats, of course, was not launched from the ship, I understand. That made twenty altogether. 25477. My impression is there is one collapsible still unaccounted for in that? - Oh, yes; I beg your pardon, one bottom up; one that was capsized. That was in the wreckage. That was the twenty. 25478. You picked up and actually took on board the "Carpathia" 13 of the "Titanic's" lifeboats? - Precisely. 25479. One of them you saw; the occupants of the boat were rescued and taken on your boat, but the boat was left in the water? - Yes, she was damaged. 25480. You did not bother any more about her? - No. 25481. That made the 14 lifeboats. Then there were the two emergency boats; were they taken on board the "Carpathia," or abandoned? - I cannot say which were the boats we took up. I took them as they came along, and after the whole thing was over we got as many boats as we could. I did not notice which they were. 25482. There were two emergency boats, and besides that there were -? - The two Berthon boats. 25483. The two collapsibles? - Yes; and there is one Berthon boat which we saw amongst the wreckage bottom up. It was reported to me that there was another Berthon boat still on board the ship. 25484. That makes 19 out of the 20? - No, excuse me. It makes the 20 if you reckon the one still left, but I am not reckoning that. It comes to the same thing. If you reckon that one in, of course it accounts for the lot. the while he had Carpathias own lifeboats swung out on davits. In addition to seeing the overturned life boat that every other one of the bodies witnesses saw, Rostron admitted he had seen one body. He knew there were passengers in lifebelts, he searched the vicinity of the wreckage, sent passengers into a memorial service, maneuvered the ship so that people wouldnt see something, and then hurriedly left the scene. More likely, Rostron saw the bodies out there, had the boats in davits, and seriously considered whether to perform a body recovery operation while passengers were in the memorial service. Additionally, Rostrons peculiar testimony about the Titanics passengers having worn life belts, which he says he only learned from passengers on Tuesday afternoon, well after leaving the disaster scene, deepens the mystery. Did Rostron see Titanics passengers as the flocks of seagulls that Mackay­Bennett witnessed, or the white dots that Bremens passengers saw? Did he realize that the seagulls or dots were Titanics passengers in life belts? Rostron wasnt asked these specific questions. But, his curiously defensive response, along with expressions of skepticism about passengers rumors --- suggests that he was posturing himself to answer those two questions in the affirmative. forth above, this excuse lacks merit. Rostron obviously saw the life belts on passengers who came in life boats to his ship, and saw at least one body floating in a life belt. He knew Titanics passengers wore life belts. Why does it matter that Rostron left the bodies behind? Leaving hundreds of people out there floating around may have made sense, given the circumstances that Rostron was faced with, including over 700 survivors in severe emotional and physical distress. But one never knows how the public perceives something. Leaving the bodies behind might have been embarrassing for Cunard. Indeed, as set forth above, one of the British companys competitors, the German steamship company, Nordeutscher Lloyd, saw to it that the horrifying word about the bodies got out when its steamships, Rhein and Bremen, traversed the site on April 20, 1912. The Germans steered very close to the bodies, and went public with the lurid details. Although newspapers reported that Mackay-Bennett had left Halifax for the disaster sight, there were no reports about the bodies rendered from that ship which were as horrifying as those of passengers aboard the Bremen. In any event, there is direct evidence (Collins testimony, and Senegals account), that the bodies were seen from Carpathia. Additionally, the circumstantial evidence is strong: Scarrot, Evans, and the other seaman and saloon steward from the Titanic saw scores of bodies at daybreak, when Carpathia arrived. Collapsible B, the raft, was purported to be in the wreckage, with the bodies. It was later seen there, along with fields of bodies, by Bremen and Mackay-Bennett. Ward reported that Carpathia was near the scene where Titanic had foundered. Rostron saw the collapsible, admits to seeing one body, and his suspicious actions in sending the passengers inside, and hanging Carpathias boats out suggest that he saw more out there than cork, wood and a capsized boat. Perhaps he prepared for some sort of body recovery operation. The manner of his testimony about being told on Tuesday that Titanics passengers wore life belts suggests, albeit remotely, that he may have witnessed the white dots that were the Titanics passengers, bobbing in the sea. He says he immediately steered for New York when, in fact, other testimony indicates that he may not have. Rostron expressed a grave concern that he could be liable to dismissal if he did something without Cunards approval, then self-assuredly insisted that he was perfectly right in going to New York without seeking anyones approval. On April 15, 1912, at about 9:30 a.m., Rostron turned the Carpathia west and steamed off, leaving the wreckage. Mrs. Pålsson, along with hundreds of others, buoyed about --- her shoulders, head and face up, eyes almost closed, mouth agape. She would silently suffer through six more days and nights of humility, after one last affront. According to the hero of the Titanic disaster, she wasnt there. The Carpathias wake lapped on her forehead . . .tish-sh . . . tish-sh . . . tish-sh. See the biography of Alma Pålsson, which includes a photograph of her and husband Nils, on the Encyclopedia Titanica website, at: http://www.encyclopedia-titanica.org. Seaman Frank Osman testified that The steerage passengers were all down below, and after she got a certain distance it seemed to me all the passengers climbed up her. http://www.titanicinquiry.org. For information on the S.S. Eastland disaster, check out the following website: http://www.eastlanddisaster.org. "Oldest Survivor of Titanic Dies, Syracuse Herald Journal, July 30, 1987. All testimony of persons is taken from http://www.titanicinquiry.org. Jay Henry Mowbray, The Sinking of the Titanic, Ch. XXI, The Funeral Ship and Its Dead (1912). Logan Marshall, The Sinking of the Titanic and Other Great Sea Disasters, Ch. 21, Bremen sighted More Than A Hundred Bodies, pgs. 246-247 (1912). Id., Marshall, The Sinking of the Titanic and Other Great Sea Disasters, pgs. 246-247. This boat was Titanics collapsible A, which was later found out at sea by the steamship, Oceanic, several weeks later. Some have suggested that the bodies sank, then refloated, for reasons discussed elsewhere, the author has discarded such theories as improbable. According to his testimony, Captain Lord followed a wide circle around the site of Titanics foundering, then left. Purportedly, one of his officer, Groves, saw some seals on a large piece of ice. Days later, the Mackay-Bennett received a message from another ship to the effect that it should check for bodies that may have washed up on the ice. (Source: Message Board, Encyclopedia Titanica). The authors criticism of Captain Rostron is not intended to discount any credit he has received for rescuing the passengers of the Titanic that morning, for which he has received more than enough praise, and characterized by author Walter Lord in The Night Lives On as the electric spark. This article focuses on a different aspect of the disaster.